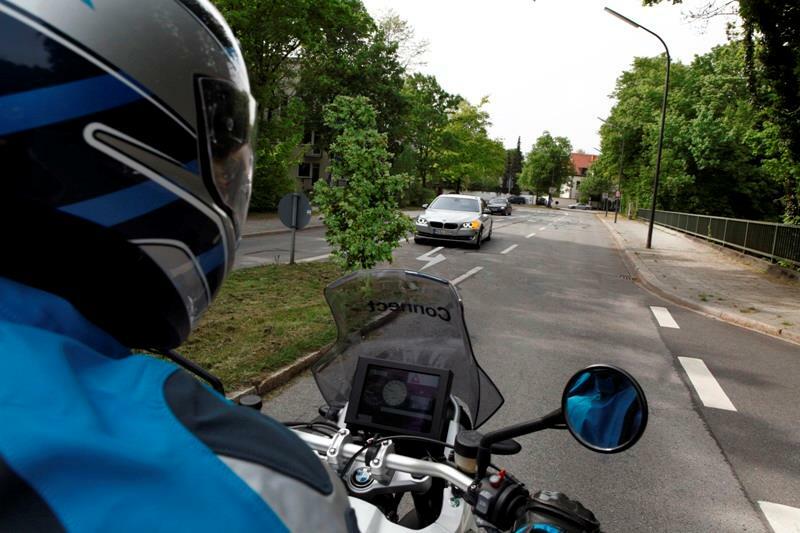 BMW has today taken the wraps off a new motorcycle and car communication system that aims to prevent cars pulling across the path of oncoming bikes. The system is called 'Turn Left Assistant' and uses a camera and laser scanner mounted on the front of a car to ‘see’ an oncoming bike and prevent a car travelling under 6mph from crossing in front of the bike. BMW has made no mention of the system being of use in countries like the UK where we drive on the left but it makes sense to assume the technology can be adapted. 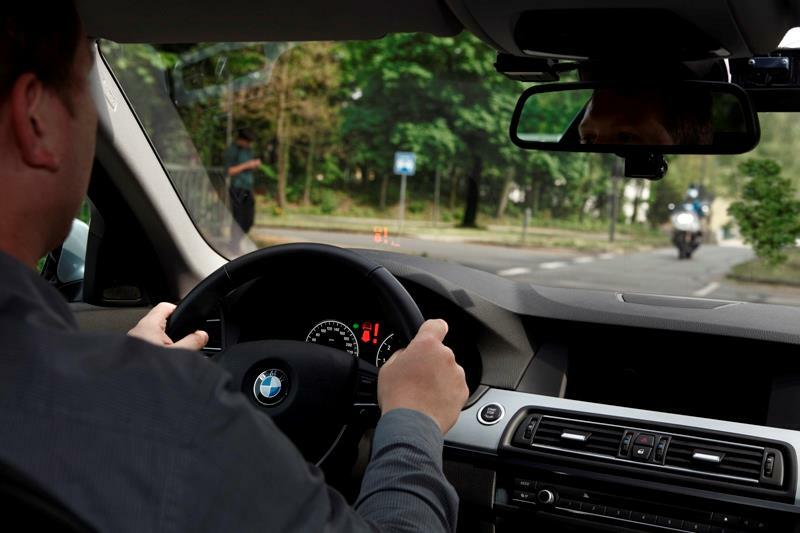 BMW explains: "The left turn assistant is activated automatically in the BMW 5 Series test vehicle as soon as the car's sensors detect that it is entering the left-turn lane and the car registers the driver's wish to turn off. Recognition of the left-turn lane takes place on two levels." "The vehicle positioning function of the navigation system allows the location of the car to be fixed to within a metre at intersections. A camera registers the turn-off lane markings and lane borders on the road. With the left turn assistant activated, three laser scanners in the front end of the car map the area up to 100 metres in front of the car." "The laser scanners pick up not only cars and trucks, but also motorcycles. If the sensors detect vehicles approaching from the opposite direction but the car continues to move into the intersection, the left turn assistant activates an automatic braking input in a low speed range up to 10 km/h to prevent a collision. At the same time, a warning sound and relevant warning symbols in the instrument cluster and Head-Up Display advise the driver of the reason for the intervention." The system also has a communication system where vehicles fitted with the system can 'talk' to each other to prevent collisions. 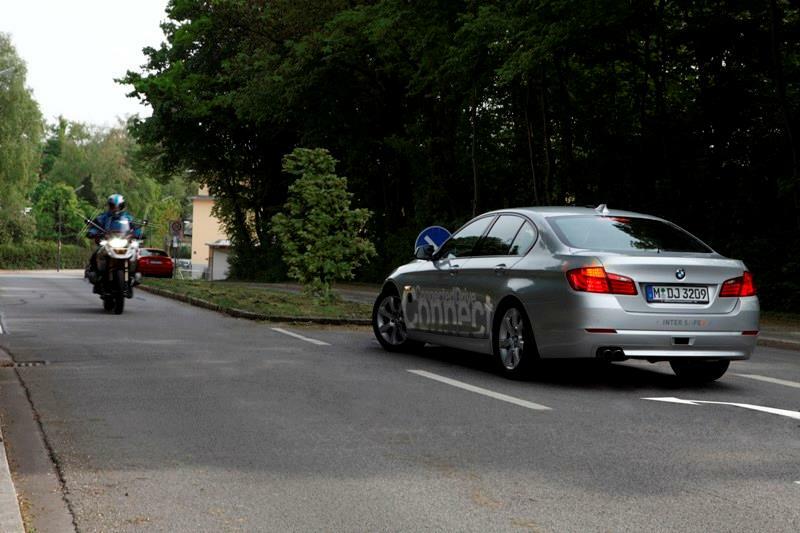 BMW says: "The possibilities of vehicle-to-vehicle communication enhance the functionality of the left turn assistant. In addition to the laser scanners and camera, the BMW 5 Series Saloon can also be fitted with a WLAN car-to-x communication unit. This device not only increases the range of the vehicle recognition function to 250 metres, it also allows the system to detect the presence of concealed road users who also have the technology on board." 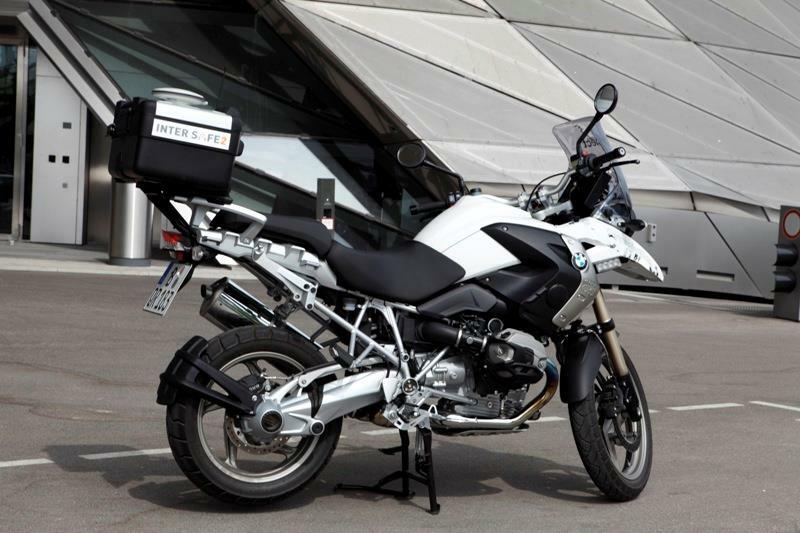 The BMW test bike is currently a BMW R1200GS. When the driver activates one of the turn signal indicators, the car detects that the driver wants to turn off to the left and the assistance system is activated. 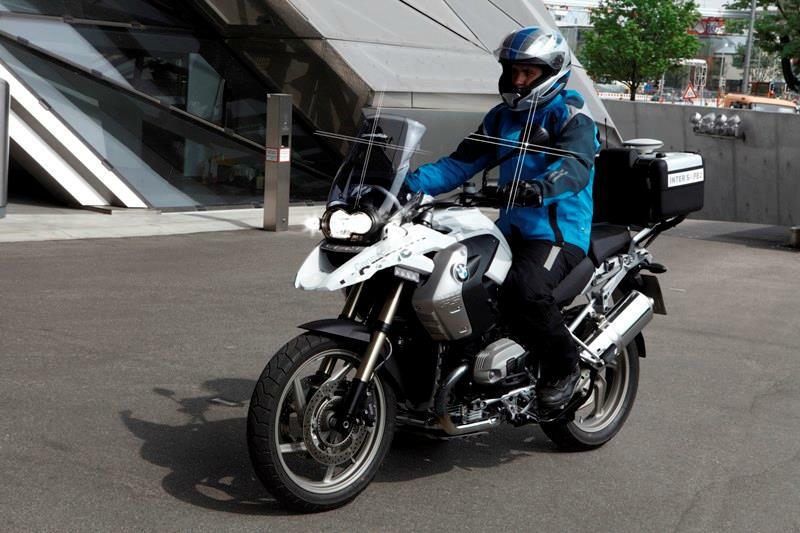 Udo Rietschel, development engineer in the BMW Group Research and Technology project said: "The car and the motorcycle communicate with one another via the car-to-x interfaces as the motorcycle approaches." “On the basis of the data exchanged between the car and motorcycle an algorithm then calculates their trajectories and identifies whether a collision is likely. In critical situations the motorcycle increases its conspicuity to warn the car driver. The level of collision risk is assessed and various measures taken accordingly; the motorcycle’s headlight is adjusted gradually, its strength increased and the flashlights and LEDs positioned on the sides of the bike and on its mirrors are activated to create a broader silhouette." Poll: Is anti-crash tech as showcased on BMW’s self-riding GS a good idea?